The Audi A3 blends the styling of a hatchback with the elongated look of a wagon without looking awkward and while retaining the sporty look you expect in an Audi. 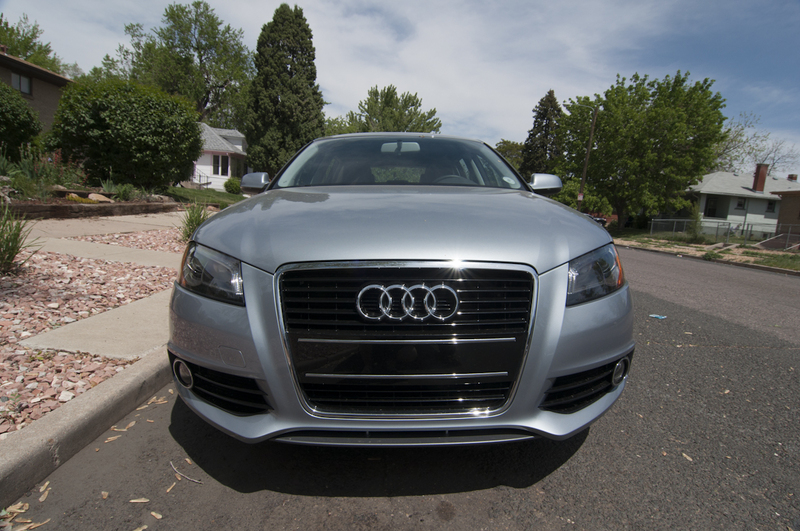 Classic Audi styling holds true with the A3, you get a mean front grill, menacing headlights and a sporty low stance. You’ll also find that Audi touted this car’s diesel engine by plastering it with stickers, thankfully they’re not over the top. There is, however, no denying that the A3 is starting to show its age a bit on the outside, and a successor is planned for 2013. The interior of the A3 is a very nice place to find ones self. The A3’s comfortable and well-bolstered front seats sit us six-footers with ease. The rear seats, however, do not. The interior is well-finished with chrome-trimmed air-conditioner vents, well placed buttons and controls and thick, robust leather. Compared to the competition at this price range the Audi A3’s interior looks far more upscale. If you have the extra cash you can also opt for some of the same wood inlays, chrome trims and decorating available in the A3’s bigger siblings. The A3 hasn’t kept up with the latest cabin technology from Audi, with their DVD-based navigation system. The navigation system’s route guidance graphics look fantastic, unfortunately the functionality is quite basic. An auxiliary display in the instrument cluster also shows turn information which is helpful. Although I didn’t care for the navigation system, I did find the the car’s stereo and Bluetooth phone system were both very good. The system paired easily with my iPhone and quickly downloaded my contact list. The system shows recent incoming and outgoing calls, making it easy to call frequently used numbers. You’ll find a proprietary port in the glove box with cables for iPod, USB, Mini-USB, and 1/8th inch auxiliary input. Again our paired iPhone allowed me to play my music perfectly. Unfortunately, the A3 doesn’t have a blind-spot-detection system or adaptive cruise control. The car does, however, come with rain sensing windshield wipers a nice feature for Colorado’s constantly varying spring weather. The A3 TDI may look no different than its gasoline-powered A3 counterpart, but as soon as you fire up the engine you will notice a difference. The A3 TDI’s turbocharged 2-liter four-cylinder-diesel engine sounds like a diesel with a slight rattle at idle and if you get out of the car you will notice a light sulfur smell in the air. The only gearbox available in the A3 is Audi’s six-speed, dual-clutch, automated-manual transmission — better know as S-tronic. What’s the first thing I do when I review a car? Stomp on the gas, of course to see what happens. Not much it turns out, the combination of turbo and diesel lag make the Audi A3 very slow off the line. At some stoplights I had a moment of panic waiting to see if the car would get underway. Once it is underway, thing change drastically. Those first tentative steps develop into a – throw you into the back of your seat – gallop. The Audi’s dual-clutch transmission can have a hard time finding a comfortable fit. Because the redline is so low in the car it needs to shift gears much more frequently than with a gasoline engine. From time-to-time while driving in stop-and-go urban environments the transmission would downshift abruptly causing a sudden jolt. In manual mode shifting can be somewhat difficult as you’ll find yourself clamoring to make shifts in time due to the low redline. I found mountain roads much more fun and comfortable in Sport mode rather than manual. The car always had plenty of boost for passing and merging. The car handles incredibly well for being a hatchback-wagon and the handling and S-tronic work well together to offer up a sporty yet comfortable ride. The “real” reason most people will be attracted to the A3 TDI is the fuel economy, and the car doesn’t disappoint. In city I averaged 32 mpg and on the highway I got about 43 mpg. My average for the week was 38.5 mpg. Lexus CT 200h and BMW 128i both of which will see you spending a lot more time at the pump. The Audi A3 TDI is a sporty, turbo-charged diesel that’ll allow you to have fun while doing your part to save the planet all while still having plenty of room for the groceries. The Audi A3 TDI checks in at $30,250. Our car came in at $38,05 with the addition of the navigation system, sport package, premium package, premium paint, aluminum roof rails and the winter weather package. Diesel driving takes some getting used to, but the 2012 Audi A3 TDI’s outstanding fuel economy makes the learning curve well worth it. The A3’s cabin and tech provides modern conveniences, comfort and longevity well above the competition.